One month from now Adopted: The Sacrament of Belonging in a Fractured World will be released into the wild where readers roam. Why am I so excited about this one book? Because I wrote it! Yes, the past couple of years I have been writing, editing, and collaborating with the good people at Eerdmans (look at their Fall catalog… *swoon*) to give birth to this work. I have been talking to my writing group and a few others incessantly through the process. I’ve been less forthcoming on the social media landscape. Why? Well, I know the road to publication is long and nothing is guaranteed, so I wanted to be prudent. I also felt that stringing you along all these months (many, many months!) would not be kind. I opted to wait until I could invite you into the conversation properly, to tell you that the book is done and soon you can have it in your hands shortly. So guess what? The book is done. The release date is set. You can pre-order TODAY! Adoption has worked on me like all the best sacraments do – a bit of mystery setting you on a trajectory of transformation. I’ve been let go by one mother and welcomed by another. You might think this is a sad story, but remember that every symphony has its minor notes, even the symphony of belonging. My forty plus years living in the company of the adopted have taught me how to enter into family with those who are different, how to cultivate belonging across boundaries, and how to embrace the light and dark of my own story. The metaphor of adoption woven throughout Scripture pushes me even further. 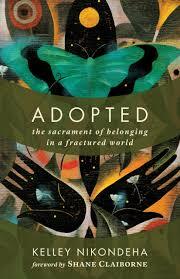 I see God meddling with family genealogies and mending broken places through adoption. God’s family is ever growing, stretching in unexpected ways to embrace those like – and most unlike – us. As Paul says, we are all God’s adopted ones. We are kin and fellow carriers of the Kingdom. As I watch adoption at work through Moses and his mothers, Jesus and his family, even Paul and the early church I see God’s holy largess at work bringing us all home. These are just some of the things adoption, the lived experience and Biblical metaphor, have taught me over the years. I wanted to contribute to the larger conversation about adoption, to share insights no one else was addressing when they spoke of my sacrament. I wanted to remind the wider world that while adoption is complicated, it is chock full of redemptive energy and has goodness on offer for all of us. It is a sacrament I want to break open and share with the church and other communities of hope. It is my deep hope that Adopted will be a gift to you as you explore the mysterious ways of belonging in a world that needs more practitioners of belonging than ever before. So let’s talk together about belonging, adoption, and inclusion. Let’s talk about the ways we get it right and the times its gone sideways. Let’s experiment with some new language from the company of the adopted and see if it helps us move forward toward connection, wholeness and family. Now you can join the conversation – because as I said, Adopted is available for pre-order! And… I am launching Footnotes, an e-newsletter to keep you in the conversation so you don’t miss out on good content, good connections and other good news. Please see the link below to subscribe! P.S. Eerdmans has a new line of audiobooks including: Reality, Grief and Hope by Walter Brueggemann, Lament for a Son by Nicholas Wolterstorff and Living into Community by Christine Pohl. Make sure you get to page 12 in the catalog to see other offerings if you want to listen to good theology! Congratulations 🎈!! How very exviting!